“Just a short line to say how sad I am to learn you are retiring on 17th August and to send you endless good wishes for all future activities – especially with the racing! I shall miss your presence on future visits to Wales. It was one of the chief attractions of South Glamorgan, as far as I was concerned! I enclose a small token of our gratitude and affection. Many apologies for the awful writing, but I am trying to learn to write with my left hand, since breaking my arm, and not being very successful! 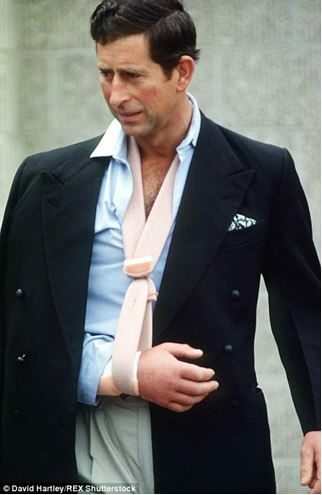 In June 1990, Charles fractured his right arm after falling from his horse during a polo match in Cirencester. 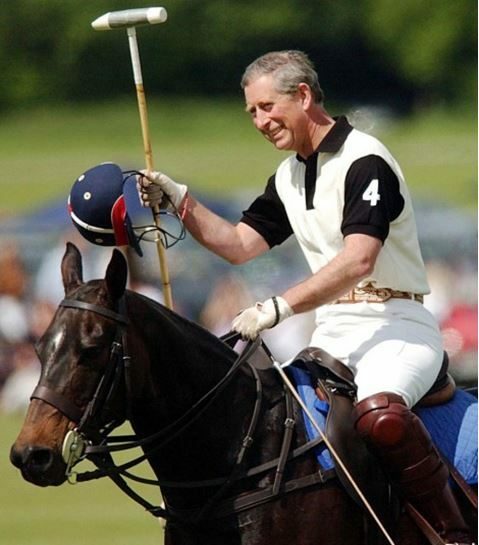 Following his injury, public appeals were made asking Charles to give up his passionate interest in polo. Harold Brooks-Baker of Burke’s Peerage told UPI, “It must be time for the Prince of Wales to realize that he is not immortal. His future subjects… must unite and demand that he reverse this kamikaze pattern.” After nearly 40 years of enjoying the sport, Charles finally quit in 2005 at age 57 due to back pain. 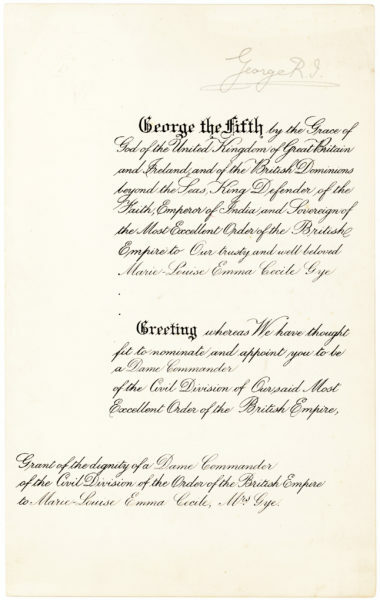 Queen Elizabeth is an avid equestrian and it is likely that our letter refers to the long tradition of horse racing in Wales, whose notable racetracks include Chepstow Racecourse, not far from South Glamorgan and home of the Coral Welsh Grand National steeplechase. Written from Highgrove House, Charles’ country residence in Gloucestershire since it was purchased by the Duchy of Cornwall in 1980. 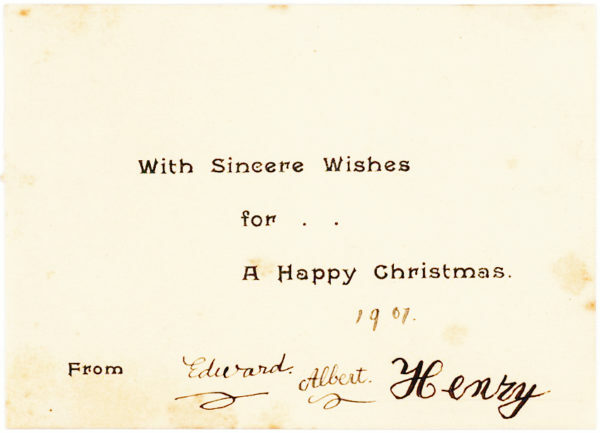 With the salutation and closing in Charles’ uneven left-handed script. 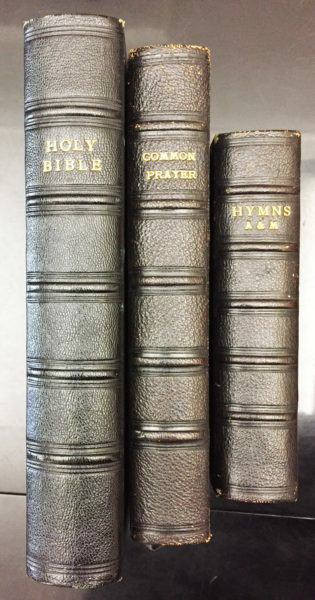 Folded and in excellent condition. 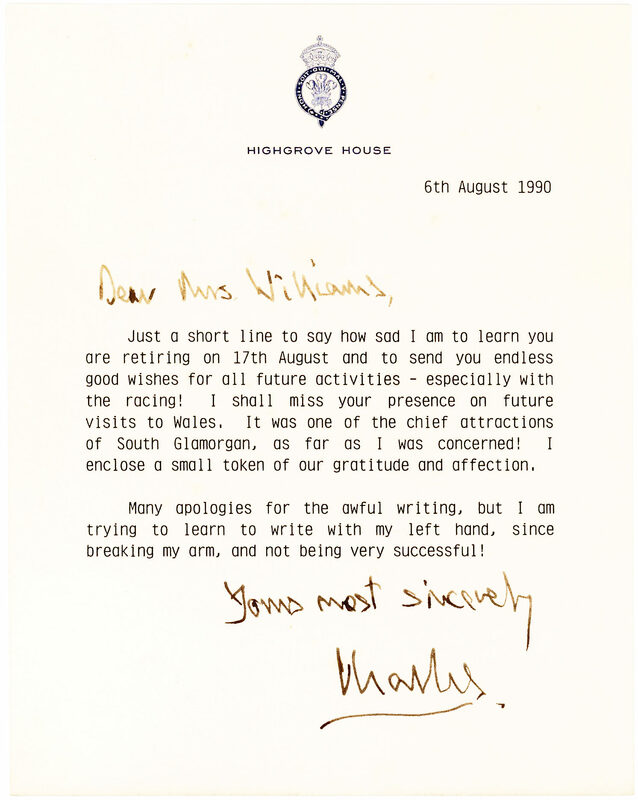 Unusual; we could not find records of any letters written by Prince Charles during this time.